East Beach Norfolk - Web Development Technology Partners, inc.
East Beach is a waterfront community in Norfolk, Virginia designed and built in the tradition of Atlantic Coastal villages. Beautifully crafted homes reflect the timeless architectural character of older traditional Tidewater Virginia homes. 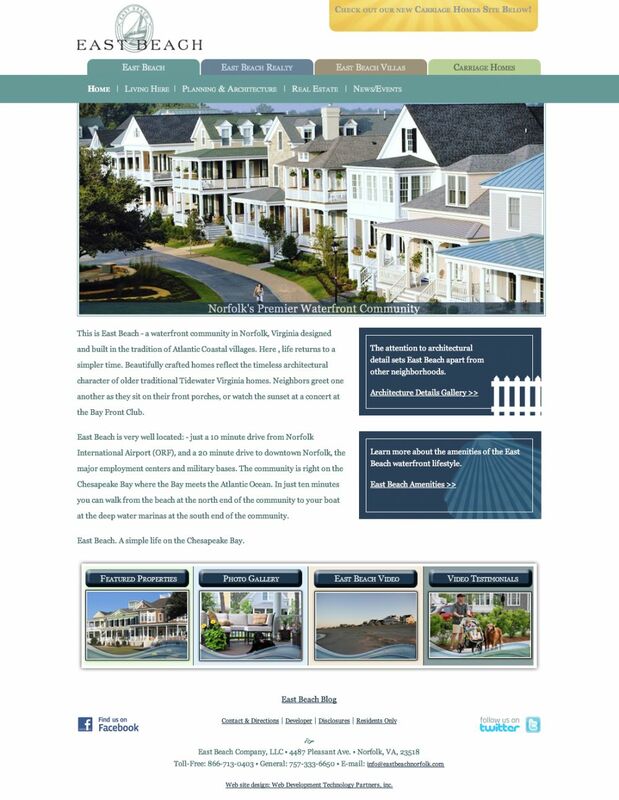 East Beach came to WDTP for a cost effective redesign for an old site that was visually stale, hard to navigate and could not be updated easily. On behalf of East Beach, I would like to thank you and your team at WDTP for creating a fabulous new website for our waterfront community. The new website look is very fresh, up to date and is full of great pictures that beautifully showcase East Beach. This is exactly the look we wanted and we are getting rave reviews from everyone that has seen it. You easily articulated the web design vernacular so that we could understand it, and your process and patience helped us stay on track as we tweaked all the details. Your sense of humor, professionalism, attention to detail and understanding of our needs made it a pleasure to work with you. I would not hesitate to recommend WDTP to anyone looking for a good web design firm. Thanks again for a great result.